With winter weather here, we want to remind you about how the Burnaby School District shares weather-related school closures. 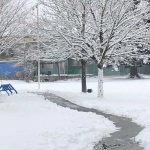 All schools will remain OPEN, unless there is heavy snowfall, damage or other circumstances – such as a power outage – that make it impossible to operate safely. The District will do its best to communicate school or district-wide closures on our website by 6:30 am. Another way to learn about school closures is on local radio and TV stations, some of which are: CBC AM 690 radio, Global TV, News AM 1130 radio, CBC TV, CKNW AM 980 radio, CityNews, Fairchild AM 1470 radio, CTV BC. Our priority is always the safety of students and staff; student safety is a responsibility we share with families. Please walk your child to the door of the school if you are unsure whether or not the school is open. If for any reason you feel that your student cannot travel safely to school then please – as you normally would – notify the school that your child will be absent.